TYWKIWDBI ("Tai-Wiki-Widbee"): Why the "Cc" ? 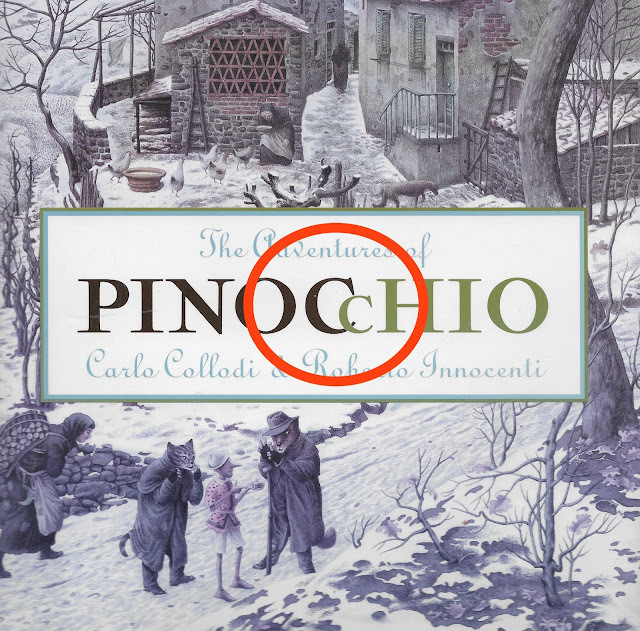 I have just begun reading The Creative Company's 2005 publication of the original "Adventures of Pinocchio," but before I could get started, my attention was drawn to the unusual typography on the cover (cropped screencap above). In the word "Pinocchio," the double-c is presented as cap-C/lower case c, and the final "chio" letters are in a different color. The book cover flap describes the author Carlo Collodi (pseudonym of Carlo Lorenzini (1826-1890)) and "an accomplished Italian journalist" and the illustrator was born in Florence, so the "cc" could be a convention of the Italian language. IIRC, I have seen this same Cc construction on old Italian stamps, but I might be wrong. Why not write it as "cc" ? Mr. Google might yield an answer, but I thought it might be more informative to appeal to the immense knowledge base of the readership of the blog. It may well be the illustrator, as you suggest, since the "Cc" isn't repeated in the text. But I also not the "chio" is a different color, so that would seem to suggest a language-based incentive for the depiction. ?? Not sure if this is what Eric P wrote before he removed his comment, but note that the Italian version of the book uses the exact same typography. Re: "language-based incentive" - that doesn't seem to work, from my perspective as an English speaker with only a few words of Italian. 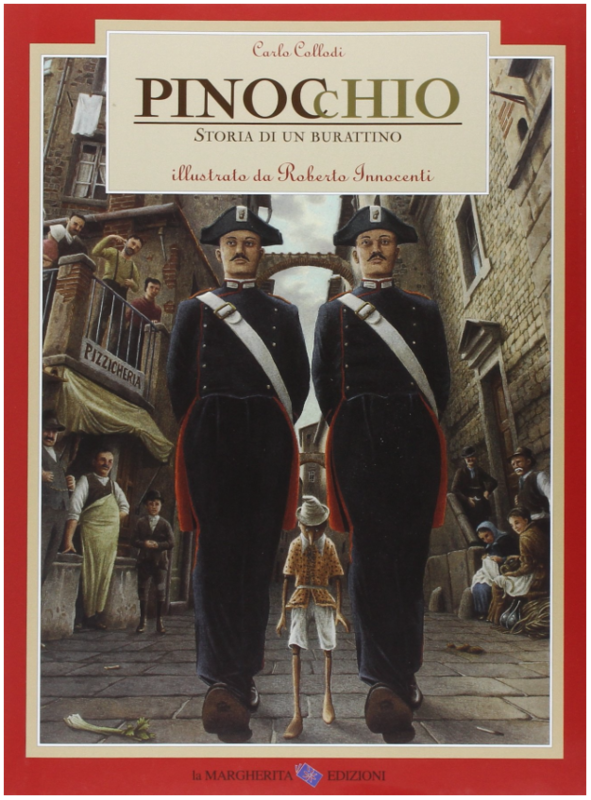 "Pinocchio" is a compound word for "pine knot" - "occhio" meaning "eye," so the color and size shift doesn't even happen at the switch between component words (e.g., PinOcchio). I don't have a better answer to the question of why the size and color are as they are, though. I posted a Google Image Search link to different covers, the illustration without any text, etc. But then I realized that based on the question, using Google was bad form. Just a hunch - but perhaps written that way to drive the correct pronunciation of the name for non-Italian speakers / readers?. A "cc" is not common in many english words but very common in Italian - so perhaps a graphical treatment to force "Pin-Oh-Key-O" vs. "Pin-nock-chee-o" pronunciation? I think it's just a way to suggest puppet and puppet maker. A not to good way as far as design goes. Maybe a reference to the author's initials, Carlo Collodi? Whichever the case, I couldn't find any indication on the web of this layout being a specifically Italian practice. I think it's most likely just typographic playfulness; compare for instance the lettering on the Disney book. The Disney one clearly evokes the strings of a puppet. Perhaps that is the case here (although the color shift then seems odd). I'm delighted to have an expert on Italian subject matter on board. No idea - but that cover is gorgeous. So are the illustrations. I hope to blog some of them when I post a review of the book. Perhaps its artistic license by the cover artist. But I'll note in other languages, you can see something similar. For example, McCloud, can be written as MacCloud or McCloud or M'Cloud or sometimes McCloud with the "c" in superscript. I've also seen it with decorative elements under the superscript c.
Perhaps this is a similar usage. I agree with the above poster that the Cc is to call attention to the initials of the author, Carlo Collodi. Perhaps this is his trademark. Could it possibly be that the 'ch' corresponds to the Greek letter chi, in some sense? So then it would correspond to PinocXio (where I write X for chi). One flimsy bit of evidence to back this up is that in Catalan, they apparently write 'Pinotxo'. I think I should forward this question to the publishers.